Come join the fun Saturday, April 27th and Sunday, April 28th, 2019 for Holden Beach’s Days at the Docks Festival. The event began with vendors selling their wares under the Holden Beach Bridge. Started in the 1980s, the Springtime festival called “Days at the Docks” hosts over 50 arts and crafts vendors and a dozen food vendors. 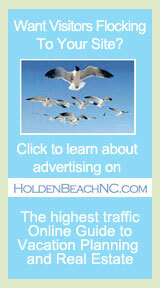 The festival starts at 9 am and goes until 5 pm at the Holden Beach Pavilion. The festival is free admission. Days at the Docks is free to the public with free parking and free live entertainment including some great beach music. For the kids, there will be inflatable rides, huge kites flying overhead and a free children’s area with games and face painting. Walk around the festival or stop by the Pavilion and have a seat to listen to some great bands. For those who love to dance there is plenty of space to shag or line dance. Around 3:30 pm (depending on the tides), the world famous “Bopple Race” takes place. Buy your “Bopples” from any merchant prior to or at the festival for a dollar. The Holden Beach Mayor and commissioners toss the “Bopples” from the atop the Holden Beach bridge and the currents carry them toward the designated finish line. If your Bopple is first or second to cross the finish line, you win a handsome prize. Bopples will sell for $1.00 each, 6 for $5.00, and a full sheet for $35.00. There will be 3 – $100.00 prizes (you don’t need to be present to win) What’s a “Bopple?” Sorry, you’ll have to attend to find that out.